Cannabis can be called by lots of different names e.g. spliff, joint, pot, hash, marijuana and skunk. I'm sure you have heard of many more. Cannabis is a natural substance, a plant. The main chemical is tetrahydrocannabinol, THC for short, which acts on the brain and causes feelings to change. Sometimes it makes you happy, other times it can make you confused and sad. The cannabis smoked today by 80 to 90% of users in Britain is the much stronger specially bred SKUNK, with an average THC content of 16.2%, the strongest they have found was about 46%. In Holland any cannabis with a THC content of over 15% is considered to be a "Class A" drug. Old-fashioned cannabis plants in the 1960s and 1970s had around 1 to 2% THC – you can hardly find them now. Cannabis resin (hashish) has always had around 4 to 6%. Another substance cannabidiol (CBD) which had opposite effects to THC used to be present in the old cannabis but has virtually disappeared from skunk, making skunk even more powerful. 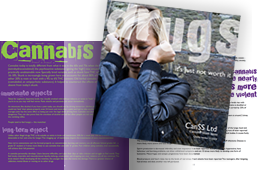 It has now been shown that THC can cause psychotic feelings in anyone, it's simply a matter of how much they take. Cannabis induced schizophrenia may be due to a genetic vulnerability. The risks of schizophrenia in those people with that genetic vulnerability are doubled if cannabis is used. Because it makes you feel good, you tend to smoke it more often. The drug comes in either; small, solid, brown lumps (which look a bit like liquorice) known as resin, or as leaves, stalks and seeds (from the cannabis plant) known as grass. Grass looks like green/brown tobacco. Cannabis may also come as sticky dark oil. Cannabis is usually rolled with tobacco and smoked in a hand-rolled cigarette called a spliff, reefer or joint. Cannabis can also be smoked on it’s own in a special pipe, brewed into a drink or cooked and eaten in food. Cooking and eating cannabis makes the effects more intense and harder to control.